The tens of thousands of green and yellow autorickshaws that criss-cross the streets of the Indian capital are a Delhi icon. Everyone - residents and visitors - has a story to tell about the three-wheeled vehicles and the men who run them. There's the rude driver who goes only where he wants to, who says his meter is "broken" and overcharges, who is shabby and unkempt, who refuses to follow traffic rules and who takes the longest route to go the shortest distance. But now, the authorities say they want to change all that. In March, the Delhi government ordered all autorickshaws to install a global positioning system (GPS). This, the authorities said, would ensure that the drivers did not overcharge. The device would also have a panic button to improve the security of passengers, they said. The order said the autorickshaw owners would have to pay 10,000 rupees ($225; £138) for the device and 15,000 rupees ($338; £208) as an annual fee. The measures did not go down well with the city's 55,299 autorickshaw owners - more than half went on a day's strike in May, throwing commuters into a tizzy. It was challenged in court too. Following protests, the government dropped the demand for 10,000 rupees up front and halved the annual fee. And the courts put a temporary hold on the order, telling the government to take no action until the matter has been decided one way or another. But the auto drivers want the decision scrapped. On a rainy morning in Delhi, Sachin Bhadoria Thakur is queuing outside the metro station in the busy Hauz Khas district with his autorickshaw. He came to the capital seven years ago from his home town Agra - the city of the Taj Mahal - to earn a better living. It's rush hour and hundreds of passengers emerge from the station every few minutes. Among them are engineering students going to attend coaching classes, office-goers on their way to work and housewives headed to nearby markets. Some choose to walk, but many jump into the autorickshaws to get to their destination faster. Sachin is waiting to get to the front of the queue, so he can pick up a passenger. The more time he spends waiting, he says, the less he earns. Sachin tells me he took a loan from a private financier to buy an autorickshaw a couple of years ago. The vehicle cost 135,000 rupees ($3,042; £1,867) but loan charges mean he has had to pay more than four times that amount. A Supreme Court order limits the number of autos in the city to 55,000 and drivers say that has meant the licences are controlled by a handful of powerful private financiers and corrupt officials. Sachin says he pays a monthly instalment of 12,735 rupees (£177; $288) for his loan and takes home about 3,000 rupees (£42; $68) - barely enough to feed his elderly parents, wife and a young daughter. He says he never overcharges, but agrees that others in a similar situation do. "I have no problem with the GPS. But I cannot afford the annual fee," he says. "I work very hard, from 6am to 11pm on most days to make ends meet. I have no money to spare. "It's nothing but a money-making scheme by the authorities and the firms that manufacture GPS devices," says Rakesh Agarwal who runs NyayaBhoomi, a charity which works with autorickshaw drivers. "It is being wrongly projected that the citizen is going to benefit from the scheme," he told the BBC. He recently filed a petition in the Delhi high court, demanding that the government order be scrapped. "The average earning of an autorickshaw driver is less than 6,000 rupees ($135; £83) a month and the government order will push them to the brink of starvation and deprive their children of education." Mr Agarwal has asked the authorities to explain how they plan to implement the scheme. "It's very clear from the government replies to my RTI [right-to-information] query that they have no plans. The transport department officials haven't even seen the GPS devices. "When I asked them the address of the control room from where the GPS devices will be monitored, they said it was still being decided." Mr Agarwal also points out that radio taxis - launched by the state government last year - are yet to be connected to any control room and the expensive GPS devices installed in them are gathering dust. But his arguments failed to impress high court judges recently. 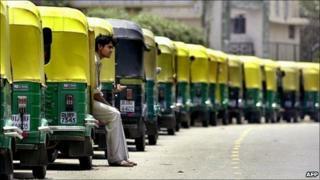 "We all know the problem of overcharging in Delhi - autorickshaw drivers do overcharge," the judges said. "If the GPS helps in curbing this by tracking the distance covered by a vehicle and other such aspects, what should be the issue?" The court is waiting for the autorickshaw drivers to file a petition before it hears the case. In the meantime, the satnav plans are on hold. The two sides are gearing up for a long battle.